"This version of chana masala uses spinach instead of tomatoes, like my favorite Indian restaurant makes. It is so easy to throw together, and pretty healthy to boot! A perfect meal on a cold winter night when served with naan and basmati rice." Heat olive oil in a large saucepan over medium heat; saute onion until softened, about 5 minutes. Add garlic and saute until fragrant, about 1 minute. Stir chickpeas with liquid from can, lemon juice, coriander, cumin, garam masala, and curry powder into onion mixture; bring to a boil. Reduce heat and simmer, stirring often, until liquid is mostly evaporated and sauce is thickened, 15 to 20 minutes. Stir spinach into sauce and simmer until wilted, about 5 more minutes. Coconut milk, instead of cream, is the key to this classic chicken curry dish. You may add more water as desired (and depending on how much water is retained from the spinach) to suit the sauce to your tastes. You can use 1/4 block frozen spinach, thawed and drained, instead of fresh if desired. Technically your version is Chana Palak. Palak meaning Spinach. 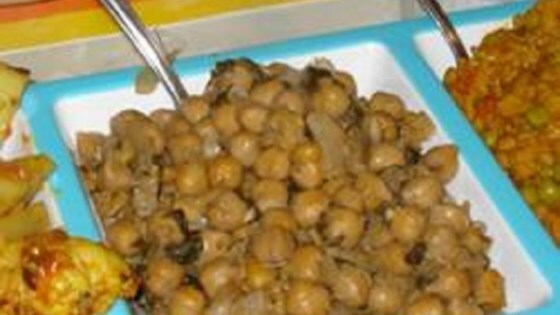 Chana, meaning chickpea, or Garbanzos. A good dish overall! I did not care for this recipe, but my husband said he'd eat it. We eat a lot of indian type food. This is the first 'flop' I've made.